2 cups chicken broth (I used the broth from the shredded chicken tacos) mixed with 2 cups water. You can use vegetable stock if you prefer. Warm the broth and water over low heat. Keep warm. Preheat the oven to 375. Heat the canola oil in a large oven proof skillet. Add the farro and stir once or twice. Pop the skillet into the oven and toast the farro for about 6 minutes. Scrap the toasted farro into a bowl and wipe out the skillet. You can turn off the oven. Return the skillet to the stove and melt 2 tablespoons of butter over medium heat. Add the onion and cook until translucent, stirring occasionally. Add the garlic and stir for about two more minutes. Add the wine and turn up the heat to high. Let the wine bubble almost all the way away. Add the farro to the pan along with a ladle full of the stock mixture and cook, stirring, until all of the liquid has been absorbed. Continue to add the stock, one ladle at a time, stirring, allowing the liquid to be absorbed before adding the next. Once all the liquid is absorbed, taste the farro to see if it’s al dente. In should be nice and nutty. Add more water if it is not fully cooked. Add the baby kale to the farro with a small amount of water and stir until the kale is wilted. 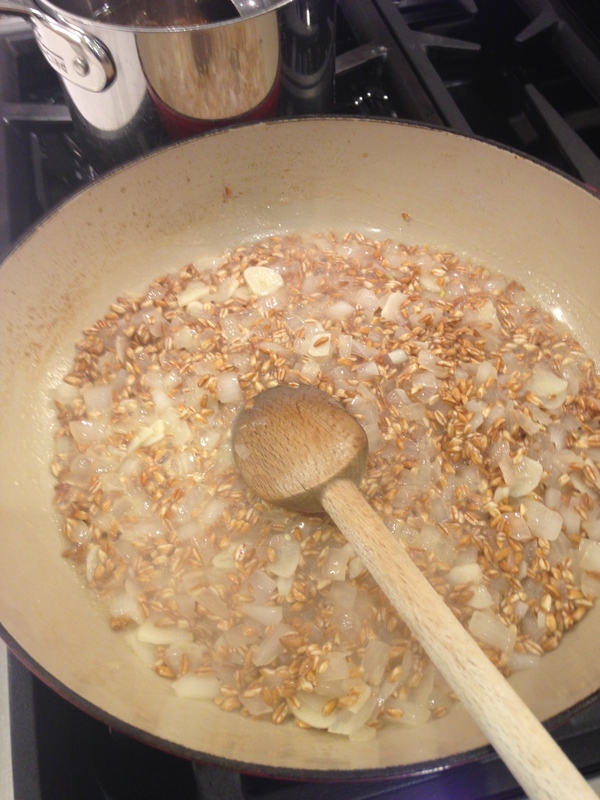 Add the Parmesan and last tablespoon of butter to the farro and stir until the butter is melted. Turn off the heat and gently stir in the roasted pumpkin. Taste and correct for salt and pepper.